Cashew is a tree crop, a small to medium tree, generally single-trunked and spreading in habit, up to 10-12m in height. In older trees, spread may be greater than height, with lower limbs bending to touch the ground. Leaves are thick, prominently veined, oval to spatulate in shape, with blunt tips and entire margins. Most cashew trees start bearing fruit in the third or fourth year, and are likely to reach their mature yield by the seventh year if conditions are favorable. The average yield of nuts of a mature tree is in the range of 7-11 kg per annum. Although the cashew tree is capable of living for 50-60 years, most trees produce nuts for about 15-20 years. 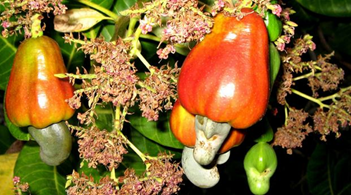 The cashew tree has been cultivated for food and medicine for 400 year. The various parts of the cashew fruits are of economic value. This include: the Apple, nut and kernel. Cashew Apple or false fruit: is an edible food rich in vitamin C. It can be dried, canned as a preserve, or eaten fresh from the tree. It can also be squeezed for fresh juice, which can then be fermented into cashew wine which is a very popular drink in West Africa. In Brazil, the apple is used to manufacture jams, and soft and alcoholic drinks. Cashew wine: Cashew wine is made in many countries throughout Asia and Latin America. It is a light yellow alcoholic drink, with an alcohol content of 6-12 percent. · In confectionery and bakery products, for example, finely chopped kernels are used in the production of sweets, ice creams, cakes and chocolates, both at home and industrially, and as paste to spread on bread. Cashew nut shell liquid (CNSL): This is a viscous and dark liquid, which is extremely caustic. It is an important and versatile industrial raw material. There are more than 200 patents for its industrial application, in particular, its use as raw material for phenolic resins and friction powder for the automotive industry (brake linings and clutch disks). CNSL is also used in mouldings, acid-resistant paints, foundry resins, varnishes, enamels and black lacquers for decorating vases, and as insecticides and fungicides. In tropical medicine, CNSL has been used in treating leprosy, elephantiasis, psoriasis, ringworm, warts and corns. Like cashew nuts, CNSL also has an excellent international market and its imports have reached almost US$10 million annually, corresponding to the sale of the raw liquid. However, the exporting country would earn much more foreign currency if manufactured products were exported. It requires a warm humid climate, with a minimum of 600mm rainfall, but well distributed rainfall is more important. Cashew thrives under a wide range of temperatures from 15º to 40º degrees Celsius. The cashew is a strong plant that is renowned for growing in soils, especially sandy soils that are generally unsuitable for other fruit trees. For the best production, deep well drained sandy or sandy-loam soil is recommended. Cashew can be propagated using either seeds or vegetative method such as grafting, budding, and layering. It takes about 5-6 years for first bearing when propagated through seeds. However, vegetatively propagated planting material is necessary to obtain higher and early yield. Planting of cashew at a spacing of 10m x 5m which will give a tree density of 200 trees per ha and at the same time providing sufficient space for growers to plant Inter-crops during the initial years of establishment. The trees grow vigorously in the first 3 years; branches hanging on the ground should be removed because they interfere with harvesting. Pest and diseases also affect the production level of the established plantation. These insect species have been implicated with economic losses estimate between 52 and 75% of the production level. · Root rot of cashew seedlings (caused by Pythium ultimum, Trow.). Floral shoot die-back reduces total nut yield by an average of 38-70%. Twig die-back cause’s more than 50% death of vegetative shoot of cashew. The loss due to root rot of cashew seedlings was estimated at 10-15% in the nursery. The harvesting and processing of cashew is very labour intensive. After producing clusters of flowers, cashews produce the edible apple, and also a nut encased in a heavy shell, which is the true cashew fruit. The cashew tree flowers for two or three months and fruit mature about two months after the bloom. Apples to be used for processing into products such as jam or juices should be picked from the tree before they fall naturally. On falling to the ground, apples may become damaged. Once damaged, the apples may ferment and deteriorate quite rapidly. The more the apple ripens, the sweeter the taste. It is therefore recommended that the apple is picked as it is about to fall. At this stage the nut is fully-grown for about two weeks and is ripe and ready for harvest. Cashew nuts should keep for 12 months or more, provided that they are dried, moisture content to eight percent or below, packed in sealed polythene bags and stored under dry conditions. Local buying agents play a vital role in the cashew supply chain in Nigeria, and there is the tendency for production to increase whenever there are many agents trying to secure supplies. The agents penetrate in villages in producing areas, in order to source supplies. Competition, especially when export prices are attractive, tends to develop between established buyers and local firms. Poor handling of cashew production and defective export packaging processes for the international market may be costing Nigeria about N177bn annually. Problems associated with acquisition of large expanse of land and initial capital outlay, also affects the investment in the cultivation of cashew in Nigeria. The total land under cashew tree cultivation in Nigeria by 1995 was estimated at about 40,000 hectares, of which about 60% of the holdings were owned by peasant farmers (Ayodele et al., 2001). Currently, the total land area under cashew cultivation has increased to 320,000 hectares (FAO, 2007). The cashew nut production has been on steady increase from 30,000 metric tonnes in 1990 to 636,000 metric tonnes in the year 2006 (FAO, 2007). This significant increase has been due mainly to the involvement of private entrepreneurs, Federal and State Governments, Cooperative societies and affluent farmers in cashew cultivation (Aliyu and Hammed, 2008). Cashew is produced in around 32 countries of the world. The world production figure of cashew crop is around 2.7 million tons per annum. The major raw cashew producing countries with their production figures in 2005 (as per the UN's Food and Agriculture Organization) are Vietnam (960,800 tons), Nigeria (594,000), India (460,000 tons), Brazil (147,629 tons) and Indonesia (122,000 tons). World’s total area under the cultivation of cashew is around 35,100 km². India ranks first in area utilized for cashew production, though its yields are relatively low. The world’s average yield is 700 pounds per acre (780 kg/hectare) of land. Currently, Nigeria has about 600,000 surviving cashew trees spread across the East West, South and Northern Nigeria, with an average yield of about 200kg to 400kg per hectare. Since 2008, Nigeria has become the largest producer. Nigeria was last the largest producer of cashew nuts in 2010. Cashew nut production trends have varied over the decades. Nigeria is the world’s 6th largest producer of cashew, with annual production volume of about 120,000 tonnes. N24billion, thus making the sector a major contributor to Nigeria’s non-oil GDP.It is widely grown in the southern states of Nigeria. Ojelade, K.T.M., 1998. Review of twenty years of cashew (A.occidentale, L..) entomology in Nigeria. Nigeria Journal of Tree Crop Research, 2: 80-91. Olunloyo, A.O. and O.E. Esuruoso, 1975. Lasiodiplodia floral shoot die-back disease of cashew in Nigeria. Plant Disease Reprint, 59: 176-179. Hammed, L.A. and A.R. Adedeji, 2008. Incidence and control of twig die-back on young cashew in Ibadan (Southwestern Nigeria). Agricultural Journal, 3 (3): 171-175. Ayodele EA, Adebola PO, Aliyu OM, Olubamiwa O (2001). Research aspect of the cashew industry in Nigeria. Paper presented at 1st Annual Conference of National Cashew Association of Nigeria (CAN), October 2001. 19 pp. Aliyu OM, Hammed LA (2008). Nigerian cashew economy: A review of nut production sector. Paper presented at the International Academy of African Buisiness and Development (IAABD) Conference. University of Florida, Gainesville, USA. May 20–24, 2008. Ezeagu W (2002). Nigeria: Assessment of the situation and development prospects for the cashew nut sector. A report of Nigerian Export Promotion Council (NEPC) submitted to Trade Centre UNCTAT/WTO (ITC) project INT/W3/69. p. 37. All data and information provided on this site is for informational purposes only. 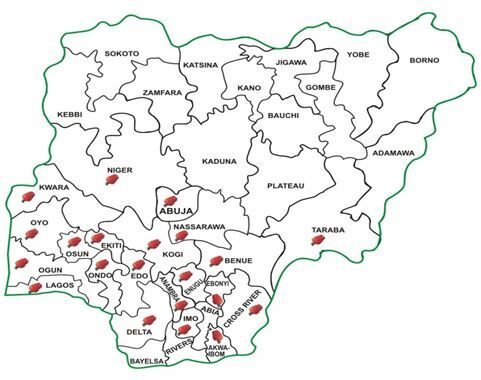 agriculturenigeria.com makes no representations as to accuracy, completeness, correntness, suitability, or validity of any information on this site and will not be liable for any errors, omissions, or delays in this information or any losses, injuries, or damages arising from its display or use. All information is provided on an as-is basis.